Young Trevor McKinney (Haley Joel Osment), troubled by his mother’s (Helen Hunt) alcoholism and fears of his abusive but absent father (Jon Bon Jovi), is caught up by an intriguing assignment from his new social studies teacher, Eugene Simonet (Kevin Spacey). The assignment: think of something to change the world and put it into action. Trevor conjures the notion of paying a favor not back, but forward–repaying good deeds not with payback, but with new good deeds done to three new people. Trevor’s efforts to make good on his idea bring a revolution not only in the lives of himself, his mother and his physically and emotionally scarred teacher, but in those of an ever-widening circle of people completely unknown to him. On his way home from school, Trevor notices a homeless man, Jerry (James Caviezel) and decides to make a difference in Jerry’s life. Trevor then comes up with the plan to “pay it forward” by doing a good deed for three people who must in turn each do good deeds for three other people, creating a charitable pyramid scheme. Trevor’s plan is to help Jerry by feeding and housing him so he can get on his feet. The next morning, Trevor’s mother becomes angry with Trevor after finding Jerry in their house. She then accuses and confronts Eugene at the school about the reason Trevor has allowed Jerry into their home. Eugene is also intrigued by Trevor’s response to the social studies project. Meanwhile, Chris (Jay Mohr), a journalist, is trying to find out why a total stranger gave him a brand new Jaguar S-Type car after Chris’ old 1965 Ford Mustang was damaged in a car accident. The stranger’s only explanation is that he is simply “paying it forward”. When Chris asks him for more information, the man explains that, when he recently visited a hospital while his daughter was suffering an asthma attack, a gang member suffering from a stab wound actually took up a gun to force the doctors to look at the man’s daughter before she collapsed, prompting Chris to begin his search again. 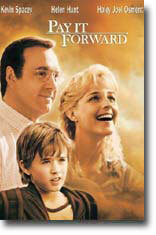 Character to watch: Kevin Spacey as Eugene Simonet.